"I didn't choose film, film chose me"
For some reason it reminds me of one of Oprah's Lifeclass lessons about listening to the whispers of life. Life leaves you clues as to what your unique path to success might be and, if you pay attention and take that route, you'll be successful. It's fascinating how Lee's career as a film maker started seemingly by fluke or a series of convenient coincidences. Everything seemed to have happen in order for him to become a film maker. Had he not made the decision to "go for it", he might not have ended up as successful as he is. This made me think about what my own clues might be. I'm paying a lot more attention now and trying to make sure I'm making decisions that leads to the right direction for me. "Whatever you do, if you do what you love, you are blessed"
When we were discussing about what we wanted to be when we grow up, I didn't really understand the "do what you love" ideology. I used to think that I had to choose within a small pool of socially accepted professional careers. Of course, there's nothing wrong with this, unless you are meant to do something else and are ignoring the clues to your purpose in life. But, now I think I get it. It doesn't matter what you love to do. There's a way to make a successful living out of it if you work hard at it. And because you love it, it won't feel like work. "That's the Muse when it visits. [...] You gotta be open to it"
I love how "the Muse" is a recurring topic for many successful people. The first time I heard about it was while I listened to The War of Art by Steven Pressfield. It's a fascinating topic to me, and perhaps that's one of the reasons why I love Pharrell's analogy of being the straw to the creative juice that comes from somewhere else. It fits perfectly with the tales of how people like Einstein, Tesla, Michael Jackson and many other successful people came up with creative and unique products. Another important thing, I think is also to trust the inspiration. Just go with it and see where it takes you. I think this is also what Jeff Koons meant when he said to always be accepting and make no judgement. "Parents kill more dreams then anyone else"
I don't think parents do it intentionally but it's true. I've seen it many times. And I would add most school systems to the list of dream killers as well. Everyone is born with special gifts that are for the most part malnourished. Imagine how much better our world would be if everyone was living their dream, sharing their unique gift with the rest of us. Good thing it's never too late to live your dream if you really want to, but it's not easy to figure out what your special gift is after years of moulding yourself to fit current standards. 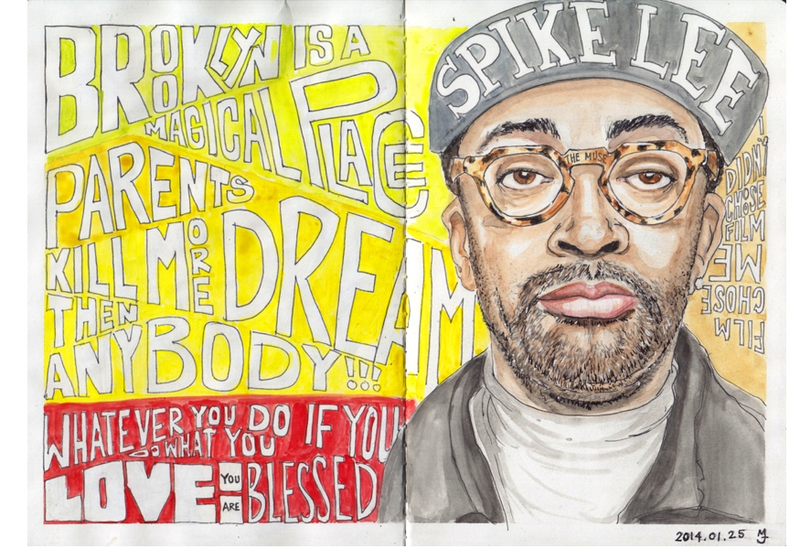 "You have to do your dreams"
The story about Spike Lee's grandparents is fantastic. To me it also explains a lot about his personality and character. What I took from the story is the importance of just going for your dreams, just do it. Decide what you want and go for it. Don't kill it before you even get a chance to try it out. "The minute that you decide that you are not going to go further, you've just decided that you are not going to go further. [...] You just got off the train." Point taken. I once heard Tony Robbins say that success leaves clues. The story of Denzel's preparation for the movie Malcom X, was exactly that : clues on how to be successful at what you do. In order to prepare for his role, Denzel put in work for a full year: He stopped eating pork, he stopped drinking alcohol, he learned to speak arabic and to read the Q'ran... All this to fully immerse himself in the character of Malcom X, which led to an improvised sequence that was better than anyone could have written. That's a lot of work for 3.5 hours on the screen, but that's what it took to bring his work at that level. That's the clue. What amount of work do I need to do in order to perform at that level? What kind of preparation is required? As much as Denzel preparing for his role. This is where loving what you do becomes essential because it's highly unlikely someone will put that much effort into something they are not passionate about.